The loop formed by the James Irvine and Miners Ridge trails is generally considered to be the best all day hike in Prairie Creek Redwoods State Park, and perhaps in the whole redwood coast, on account of the profusion of huge, old growth redwoods, the very dense undergrowth, the quiet, undisturbed surroundings and the variety of landscapes; although all is through deep woods, the surroundings range from moist, fern-covered valley floors to drier, more open hilltops, and the west side of the loop has the added attractions of Gold Bluffs Beach and Fern Canyon, a narrow, sheer-walled ravine. The full distance is 11.3 miles, though a shorter loop can be made using the connecting Clintonia Trail, which joins the two main routes about half way along. The most used trailhead is at the east side, located at the edge of Elk Prairie beside the state park headquarters; from here the two trails head northwest, one (James Irvine) along valleys, the other (Miners Ridge) over hillier ground then down into an adjacent ravine, through a particularly dense, dark section of the forest. Both paths end at Gold Bluffs Beach Road, which is reached via the unpaved Davison Road (not for vehicles over 28 feet), hence two shorter loops are possible, both 7 miles in length, along either the east or west halves of the full circuit. Topographic map of the Miners Ridge and James Irvine Trails. 16 views along the Miners Ridge and James Irvine Trails. Panorama of the bridge over Prairie Creek, near the east end of the James Irvine Trail. The Elk Prairie trailhead has limited parking so late arrivals may have to use other areas further up or down the access road. Several paths begin here, including a short nature loop, and all intersections are well signposted. Three junctions are passed in quick succession; first is with the Prairie Creek Trail, which heads north, meeting Zig Zag 1 Trail after 2.9 miles and Zig Zag 2 Trail in 4.3 miles. The second (West Ridge Trail) also intersects these two paths, after 2.3 and 3.8 miles respectively, while the third marks the start of the James Irvine Trail, signed 0.6 miles to Miners Ridge, 3.3 miles to the Clintonia Trail. 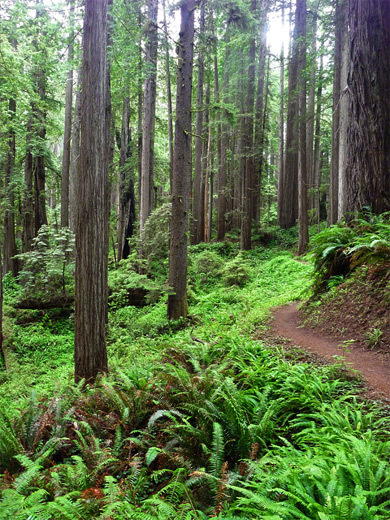 The James Irvine Trail at first encounters fairly light, open forest, the floor mostly covered by large ferns, growing between big but well separated redwoods. The route crosses a minor creek on quite a high footbridge then starts to climb, up the south side of the much wider valley of Godwood Creek passing many magnificent trees, through one short switchback to the next junction at the start of the Miners Ridge Trail (on the left); distances here are 1.6 miles to the Clintonia Trail and 3.6 miles to the beach, while the James Irvine Trail continues to Clintonia 2.7 miles and Fern Canyon 4.2 miles. Turning left, the Miners Ridge route runs along a ridgetop, sloping upwards fairly gently through airy surroundings, giving good views across the ferny hillsides to the south. 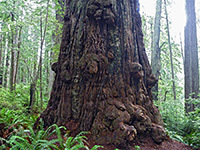 There are many redwoods though none are exceptionally large, since these upper slopes hold less water than the moister areas in the valley floors. The path steepens briefly before levelling out on top of the ridge, staying flat for the next mile. 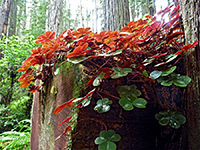 Almost everything in the forest is green or brown, apart from occasional flashes of color, from delicate white or yellow flowers, red berries, and the red/purple sheen on the underside of some leaves. The scenery is unchanging up to the Clintonia Trail junction, whereupon the Miners Ridge Trail turns west, stays level a little while then descends rather steeply into a side ravine of Squashan Creek, where the trees become noticeably larger, and grow more closely. For a while the forest is as dark and dense as anywhere in the state parks, before the trail reaches the valley floor (a logged area) and turns northwest, later merging with an old forest road, as the second growth redwoods are replaced by coastal vegetation and the trail emerges to the wide sands of Gold Bluffs Beach, from where Fern Canyon, and the west end of the James Irvine Trail, are 1.4 miles north. 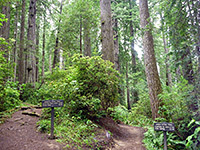 From the south junction with the Miners Ridge Trail, the Clintonia Trail is level at first, traversing overgrown spruce woodland and passing several short, narrow side paths to redwood memorial groves. Once past the ridgeline, the land falls away steeply to the north, allowing long views down, to the upper end of Home Creek valley. The trail descends slowly, via a long switchback that seems unnecessarily gentle, then crosses undulating land where the redwoods reappear, to an intersection with the James Irvine Trail. At the junction, Fern Canyon is 1.5 miles northwest, while the park headquarters is 2.8 miles southeast. The James Irvine Trail begins in the west at a patch of woodland just beyond the terminus of Gold Bluffs Beach Road, 7 miles from US 101; it follows the north rim of Fern Canyon, past a junction with the short loop that descends into the ravine, then detours around a much deeper, wider valley that joins from the north, before returning to the main drainage and following it upstream, gaining height only gradually. A short, steeper ascent at the head of the valley leads to a low saddle separating Home Creek from the adjacent Godwood Creek, which is then followed all the way to the eastern trailhead. Near here is the junction with the 1.6 mile Clintonia Trail, linking with the Miners Ridge Trail to the south. Godwood Creek flows through quite a wide valley, densely wooded, and filled with much understory vegetation. The path stays close to the stream for a way but starts to climb after a while (this is a new alignment; the original remained at creek level), winding around several south-side tributaries and reaching the Miners Ridge Trail; from here, the park headquarters is 0.6 miles away.